l.a.Eyeworks began on September 9, 1979 when Barbara McReynolds and Gai Gherardi opened a single storefront on Melrose Avenue in Los Angeles, California. To challenge the prevailing norms of eyewear with proposals for a new, provocative revelation of the face. More than three decades and hundreds of frame designs later, l.a.Eyeworks remains a privately owned house of optical imagination, encompassing two namesake retail stores in Los Angeles and a wholesale company that channels its influential designs to a global network of independent opticians and retailers. 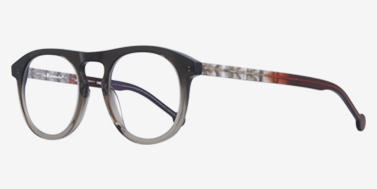 Original, often iconoclastic, and always invigorating, eyeglasses designed by l.a.Eyeworks are immediately recognized for their bold shapes, imaginative handling of materials, and expressive use of color. Working from deep intuition, McReynolds and Gherardi begin each of their limited-edition designs with a hand-drawn sketch, the first step on a path of meticulous production where the finest materials are shaped by a combination of technology and hand-finished crafting. Every aspect of an eyeglass frames shaping and construction has at one time or another been re-thought and re-invented as part of the designers' restless imaginations. The result is an expanding legacy of glasses that balances innovation with wearability, walking a fine line between optical tradition and a redefining expression of the "now." Although l.a.Eyeworks have graced the faces of celebrities, performers, artists, and athletes, the deeper intention is for you to find a frame that conforms to no fashion sensibility but your own. In addition to groundbreaking eyewear designs, l.a.Eyeworks has made an indelible stamp on the look and language of what an eyewear company can be. From streamlined architectural spaces to the cases that protect the frames, no detail is left untouched as a subject for creative investigation. Retail store windows, for example, are a messaging platform to invoke conversations about vision, culture, social equality, freedom of expression, and sometimes, the power of a really good pun. An abiding love for artists has been the genesis for an ongoing series of in-store exhibitions, event programming, and commissioned works, including a series of artist-designed cleaning cloths.